Pocket City guide is something sorely needed right now. 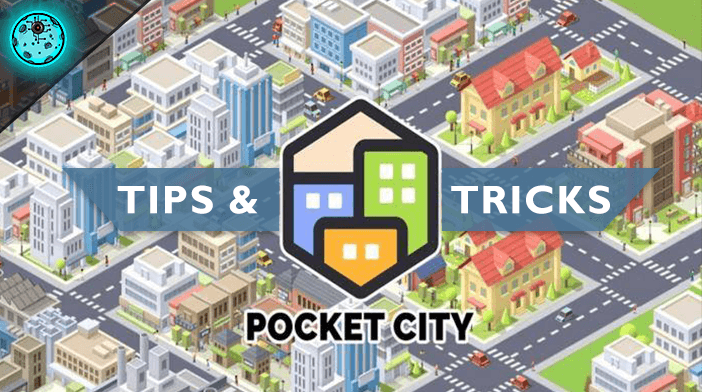 All major sites and lists include Pocket City mobile game in their top 10 free to play games lists, so naturally, there are various sources for tips and tricks out there and a rising need to filter the good and weed out the bad advice. 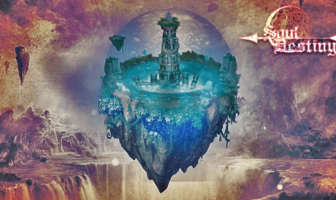 The content found on the web seems to mostly point to helping the player maintain and extend his gameplay as much as he can, for apparently, it is not that simple. 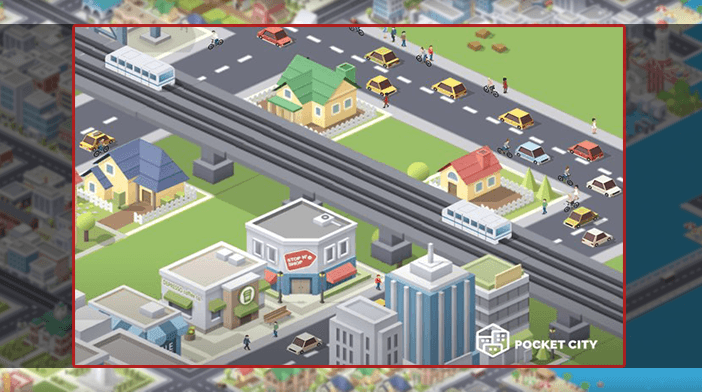 Pocket City tips found on the web mostly point out that it is tricky to maintain a balance in your city’s infrastructure, so right off the bat all quick money guides, hacks, and everything pointing towards somehow bending the rules of the game is useless and should be avoided. 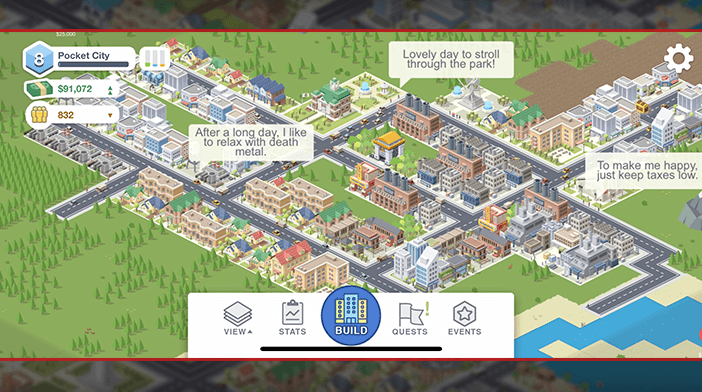 In order to really enjoy this game and get the best out of it, you really need to get a firm grip on governing your city, and here are some small tips and tricks that will hopefully help. How to recover from a tornado in Pocket City? If you ever follow the news after a hurricane, wildfire, or some similar disaster destroys a town or a city, you would undoubtedly hear the city’s planners and officials say the word ‘decentralize’ often. It means precisely what it says – the officials are well aware that they often cannot prevent or predict natural disasters and so they are trying to decentralize their city’s infrastructure so that when one area is destroyed, not all vital buildings will be there. 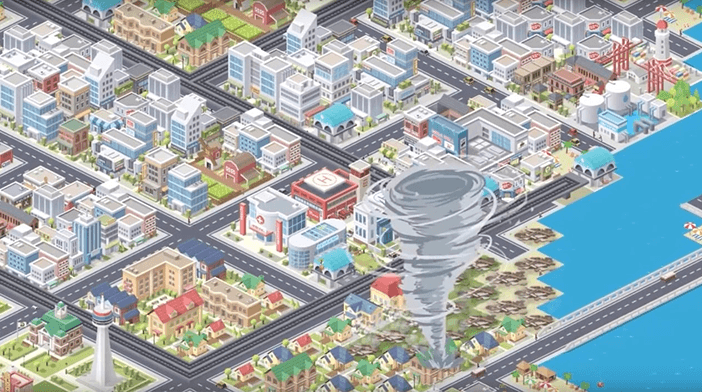 In Pocket City, tornadoes are a regular occurrence and will hit your city often. If they do, do not stress about it. Take it as an opportunity to decentralize your vital buildings. Meaning, do not cram all the main buildings like the town hall, fire dept, police station, hospitals, schools and others in one place, one block, or too close. If you do and the hurricane hits that area, you will be left without a vital spot of your city for a precious amount of time. Also, always think in terms of spreading never cram any zones too much together. Your impulse will be to have a nice community where everything is available to all, but when starting, just spread with roads as much as you can. If a disaster does manage to hit you, organize a party! It is particularly important not to centralize and cram all your buildings together when you start building a new city because later on, as you unlock new buildings, you’ll have to demolish to make room. Once you’ve grown and you feel you do not need to expand anymore in terms of land and space, you can upgrade your buildings. 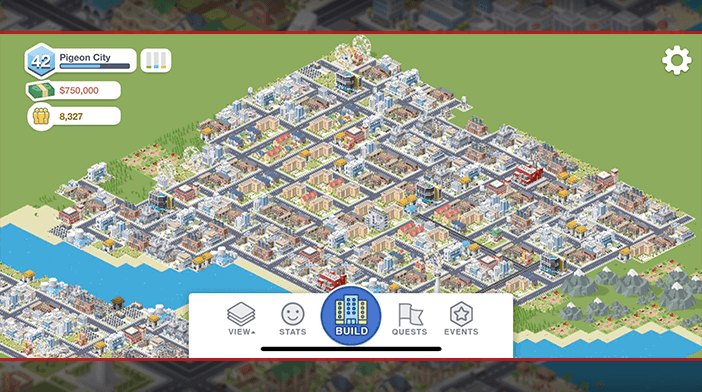 Pocket City upgrading zones and buildings are simple, just tap on Build, then Zones, then Upgrade, and then mark the desired area you wish to upgrade. You can select anywhere from a single square to your whole city but mind the cost. Pocket City roads are easy to build and are quite comprehensive. 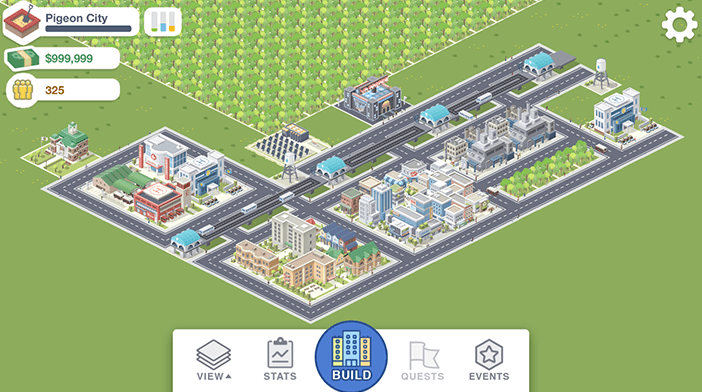 Just tap “Build” and then select the type of road you need. IT is recommended you use only basic roads inside your city. When you feel you’ve reached a limit of how your city will grow for some time, then you can circle a highway around it. 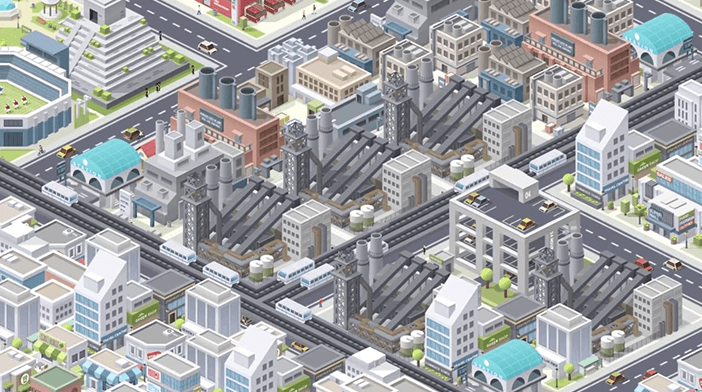 How and where to build Pocket City bridges is something entirely up to the player and the terrain, while railways can be tricky. A railway can go from city to city and connect long distances, but it should go through the city, so leave enough space. As far as how to build bridges, it is as simple as building roads. Players usually get stuck somewhere mid-game. Everything was going fine up to a certain level, and then they just seem to run out of money. To manage this, you need to manage your taxes, imports, and other vital goods. Tap the “Stats” menu and get familiar with the layout. As long as your Sales Tax + Income Tax + Property Tax is higher than Zone Upkeep and Import/Exports, you are good. Also, you need to balance Supply and Demand as much as you can. Commercial Zones will increase Supply, while Higher Population and Happiness will increase Demand. If you are not producing enough Materials, Food, and Natural Resources, you may be spending too much on imports, so try and aim for a City infrastructure that allows you to produce at least close to what you spend. Pocket City traffic is generated as Citizens drive from their Residential Zones to places of interest, like Industrial Zones or Commercial Zones. Successfully connecting these three basic City zones is crucial for healthy city infrastructure. With that said, citizens will not travel much between two Residential Zones, so plan this accordingly. Again, it is best to spread as much as you can in terms of space and land, not to cram everything up tight from the start. Also, make sure each tile of Commercial Zones and Industrial Zones has access to a road from at least one side. Railways can help reduce traffic congestion, but it will take up precious space. How to get rid of rocks? Pocket City Dynamite service is unlocked at level 22 and it costs $1000 per tile. To access it, tap “Build”, then “Services”, then “Special”, and “Dynamite is the second option from the top. Pocket City export capacity increases with docks. You build one dock at level 18, two docks at level 30, three docks at level 40, four docks at level 55, five docks at level 70, and six docks at level 99. How to find Yoga practitioners? Pocket City Yoga practitioner is usually found near Residential Zones, just look for the purple Yoga mat. How to find a fisherman? Fishermen are by the water, so it will be simple. How to find a cat colony? Pocket City cat colony is comprised of three or more cats, and they are found randomly throughout the city, although some say more likely near Commercial Zones. ‘Pocket City how to find Busker?’ is one of the most common questions asked by players online. It is a guy with a guitar. You can hear Busker playing the guitar when you zoom in all the way and he is usually near a Commercial Zone. How to find a Criminal Hideout? Pocket City Criminal Hideouts are a bit tricky to find if you have a tight Police Department Coverage. Tap “View”, then tap “Crime”, and then zoom out and try to find a small, dark area with high crime. After that, zoom in and check if there is a high number of criminals walking the streets. Then revert to normal “View” and tap the building at the center of the dark area. 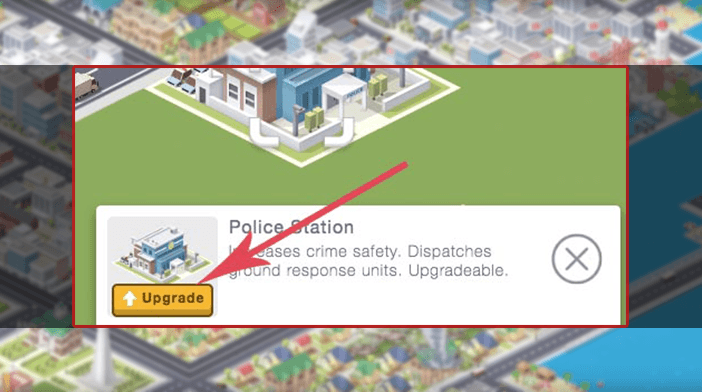 If it is a Criminal Hideout, you will get a Dispatch Police option to tap.